This packet particularly lends itself well to a project teaching basic concepts of COLOR—Creating a Color Wheel (Grades 1-5), ALSO worksheet templates (yellow pages in master workbook) titled Color—Tints and Values, Color—Shades and Values, Colors—Mixing Warm and Cool and Mixing Primary Colors. Flowers at Jefferson Memorial and Snoopy-Early Sun Display on Earth are full of LINE, PATTERN and RHYTHM. 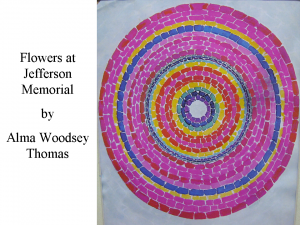 Additional paintings, by Alma Woodsey Thomas, in the same broken colored LINE style, have been added to this packet by other volunteers, to suggest additional projects using her style. This is a good packet for defining and discussing ABSTRACTION. Sunday Evening Radio has various PATTERNS in the wallpaper, rug, floorboards and the girl’s dresses. TEXTURE can also be found in the clothing of Sunday Evening Radio. Most clothing illustrates some type of TEXTURE, often in the way the artist paints the cloth to look like it is folded or draped. The way Alma’s red dress reflects the light is a technique Laura Wheeler Waring used for creating TEXTURE in the portrait, Alma. Les Fetiches is a painting with a major emphasis on SHAPE. It is especially effective with younger kids (K-2) to have them point out the various geometric SHAPES in this picture, but all grades can benefit from searching out the various SHAPE used throughout the picture (Aesthetic Scanning). The SHAPE in this picture is repeated to create PATTERN and RHYTHM. Discuss the differences in the Styles of these artists. Lois Mailou (my-loo) Jones is a pioneering and masterful twentieth-century American artist. Lois has overcome many racial prejudices and roadblocks to become a creative artist who has been a brilliant painter. Lois was born in 1905 and has lived throughout most of the 20th century and into the 21st century. Jones began her career, after excellent preparation at the school of the Museum of Fine Arts, in Boston, at a time when racial prejudice and discrimination were regular features of American life. Although she was born in New England, her life wasn’t free of subtle color barriers. The Washington, D.C., in which she settled in 1930, was a leading example of Jim Crow practice. This meant that Black Americans could not drink from the same drinking fountains as white Americans. Blacks could not ride in the front of the bus with white people, or sit at “whites only” tables in restaurants. In the early part of the twentieth-century, many people felt that treating dark skinned people as if they were not as good as light skinned people was acceptable. They didn’t stop to think that it was mean to treat anybody as if they were not important. They didn’t think about hurting other people’s feelings at all. Jones engineered her professional place in the art world in spite of these types of barriers. 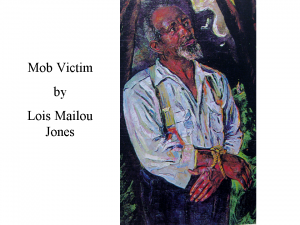 Sometimes she entered her works in exhibitions, which did not recognize African-American artists, by having her white friends deliver the paintings for her. In other cases, prizes that had been originally awarded to her on the merit of her talent, were taken away and given to her white competitors when the judges realized Lois was an African-American artist. She had proven that she was extremely talented but sometimes judges took the awards away when they saw the color of her skin. It was very sad the way some white people treated very talented black artists. Lois was lucky enough to have some fortunate experiences with fair-minded arts people, who were wise enough to understand her exceptional talent and did not think about the color of her skin. Many white Americans, throughout Lois Jones’ life, did not believe that a black American woman could actually be as talented as she was. She really surprised them! Lois went to France to study art for awhile. There she was free from negative U.S. racial attitudes. Lois often found herself well received and respected in Europe, while people at home were often disrespectful of her, because of her skin color. In spite of these trials, Jones prevailed on the basis of her talent, energy and persistence. She always refused to be discouraged. Cultures all over the world use masks for ceremonies and celebrations. People wearing masks can pretend to be animals, legendary beings, or supernatural spirits. Have any of you ever worn a mask and pretended to be someone or something else? The title of this painting (pronounced lay fay-teesh) translates as objects that people think have magical powers. Many ancient cultures of the world felt that a mask could literally turn you into a magical or different person. There are many cultures left in the modern world that still believe this. 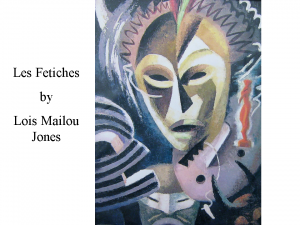 Lois Mailou Jones’ painting is inspired by the African art of her ancestors. She borrowed the subject of this painting from real African masks. The masks and carvings do seem to have a kind of magical power that makes us want to look and wonder at this picture. At first, it’s hard to understand exactly what we are looking at. We see a face, but it isn’t easy to tell what the other shapes in the painting are supposed to be. We need to look at this picture for awhile to recognize any of the other SHAPES as masks. Then we notice these are strangely, decorated SHAPES with eyes, noses and mouths. These masks and carvings are more ABSTRACT than they are realistic. ABSTRACT means that the artist concentrated on creating the SHAPES she saw in these masks, instead of making the masks look like a real person. Ms. Jones thought the abstract, geometric shapes (circles, triangles, squares) in African Art were the things that made these masks fun to look at. She was also very interested in the cultures the masks came from. Learning about the cultures gave her clues to what these masks meant to the original people who created them. The painting makes us curious about the African customs and African artists who originally produced the masks. Can you find the faces that have horns? How many OVAL SHAPES can you find? Oval eyes and mouth on large mask. The mask on the right, just below and behind, is oval. How many TRIANGLE SHAPES? The nose, the forehead (right) and area under the left eye, on the center mask. There is also a triangle zig-zag line around this mask for hair. Horns. How many CIRCLES? The face below the main masks has two circles that seem to indicate a mouth and eye. How many square or rectangle shapes? The eye on the striped mask uses a square to create an illusion of depth. The curved, white, triangle shape, touching the square, helps our minds see that the eye is a hole, with dimension. The mouth is a space that looks cut away. The cut away, or NEGATIVE SPACE, is square or rectangular. Notice how the artist has used a FORSHORTENED, or squashed, square and rectangle on the mouth of this mask, to give it dimension. What do you think the red shape is, in the section of the picture? This probably represents a primitive African carving that resembles a human. You have to look at this shape for awhile before you can see something that looks like a human profile. Create an African mask, with painted geometric shapes and raffia. Cut or trace large ovals on tag board. Corrugated cardboard ovals, or U-shapes, also make heavy duty mask bases. Half a paper plate works well for creating a mask for younger kids, if you cut out eye circles ahead of time. Glue construction paper geometric shapes for decorations. Display some real African mask pictures and let kids use these as a springboard for their creativity. Large paper grocery sacks, with eyes cut out, make great mask bases for young kids. These can be easily slipped over the head after decorating. If the top of the bag is folded down a couple of times, it can strengthen the base of the mask enough to sit on a counter and display in the classroom. Check thrift stores for primitive style statues and masks. These are often found among the wooden items. Import stores also have things like this. Create a Still Life arrangement using primitive sculpture items. Don’t be afraid to use some red paint on a wooden sculpture, to add more color. African artists enjoyed bright colors, contrasts and geometric patterns. If you can’t find any of these already made, get a little creative and make some counterfeit primitive African sculptures. Animal print fabric pieces would add variety for a Still Life like this. Have kids paint their Still Life on black construction paper for more dramatic contrast. Create a Still Life arrangement for the kids to paint, which features typical modern American “lucky charms”—horseshoe(s), rabbit’s foot, shamrock decorations, leprechauns, a box of Lucky Charms cereal, etc. 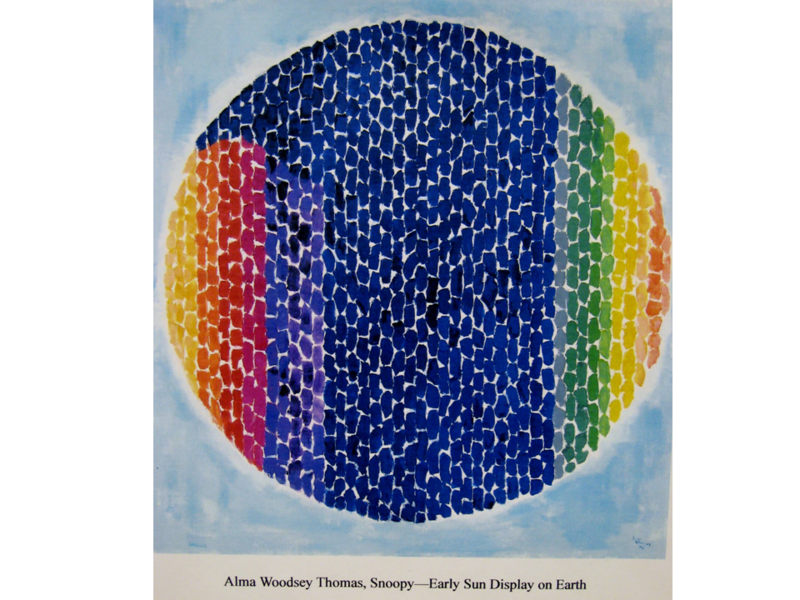 Alma Thomas was born in 1891, in Columbus Georgia, in the deepest part of the South. Alma spent her summers at her grandfather’s plantation, in Fort Mitchum, Alabama. It was here that she created her first experiments as an artist by molding objects from riverbank clay. In 1907, when she was 15, Alma moved to Washington D.C. with her family. The rest of her life, except for six years when she taught in Wilmington, Delaware, Alma lived in Washington D.C. She attended Armstrong High School, in Washington D.C., and fell in love with the art room. Alma received a teaching degree at Howard University, in 1924. She was the first and only graduate at the time, from Howard University’s Fine Arts Department. 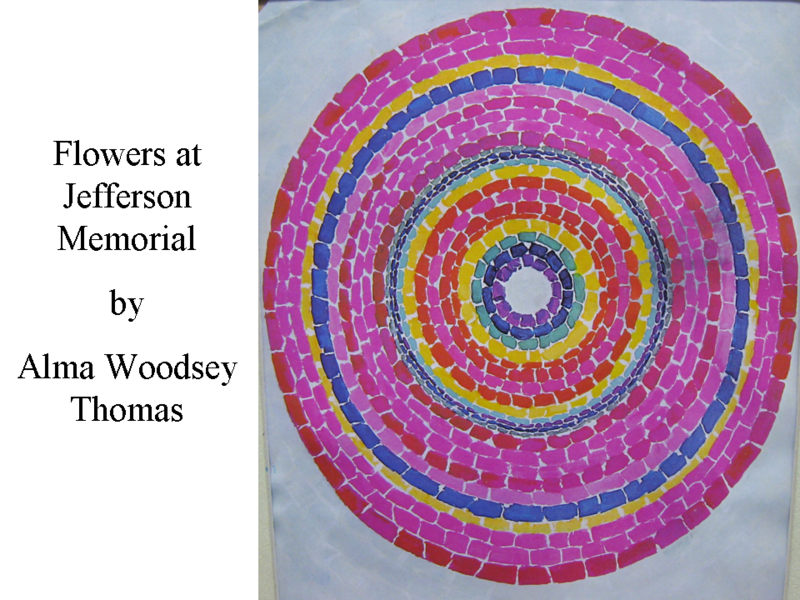 Alma Thomas spent most of her career teaching, from 1925-1969, in the Washington D.C. Public School system. She built bridges from poverty to the world of art for thousands of children in the mostly black, Shaw Junior High School, in Washington D.C. When Alma was 66, she left teaching to begin painting full-time, which she did until her death, at the age of 86, in 1978. During her lifetime, Alma accomplished many firsts for African-American women in America. She was the first African-American woman to ever receive a Masters Degree in Fine Art (Columbia University, 1934). Alma was the type of person that did just what she wanted and broke the mold for all black artists. She was a woman (most African-American artists of the time were men), she never married, she was highly educated, she was an explorer and, most of all, Alma didn’t feel bound to only paint scenes depicting the life and people of her race. Most of the inspiration for her paintings came from her garden, her flower box and nature in general. Her early paintings were realistic but, by 1959, they became non-representational (ABSTRACT). By 1964, and after her retirement, Alma’s paintings became almost totally lines of bright color. Much of her inspiration for these later paintings came from the patches of colors she found looking through her window. About her life’s journey though Art, Alma said, “My life in art has been divided into decades. In the twenties (1920’s) I was interested in sculpture… then, representational art (realistic) in the thirties, along with marionettes (string puppets), which I studied. My master’s thesis was on the making of marionettes, in 1934… In the forties and fifties I taught, had clubs of children and started my move into purer color formations. During the sixties I started my own personal style.” Until her death, at age 86, Alma enjoyed and devoted her life to art. Alma concentrates on the interaction of bright, vivid, flat COLORS. Her later paintings were created with small brushstrokes that launch a direction on the canvas. This circle painting uses small brushstrokes, or broken LINE, in vertical PATTERN. The other painting, Flowers at Jefferson Memorial, has a RADIAL BALANCE design for the brushstrokes (the design moves out or radiates from the center of a circle, like bicycle spokes). Other paintings have a vertical or horizontal pattern. These multicolored patches create a sense of light and RHYTHM. The paintings seem lively and exciting. These paintings don’t look like anything realistic. They are just designs of PATTERN and COLOR. Notice the many Shades or Tints of color in each section of this painting. Not all of the blue brushstrokes are the exact same blue. It is the same with the purple, yellow, green and red sections. How can you change the Tint or Shade of a COLOR? Add white for a tint, black for a shade. Create a Radial Balance design (moving out from center, as in Snoopy-Early Sun Display on Earth) on a paper plate, using bright color and small brushstrokes to create a broken LINE PATTERN. Create a vertical, horizontal, or diagonal design on a square piece of construction paper, using broken LINE. After you tell everyone the name of this painting, ask them if it looks like its title to them? …or… Ask the class if they know what the painting is a picture of? Do you see any flowers in this picture? What do you think the artist meant when she gave the painting this name? Maybe she was painting the colors she saw in the flowers. What is the Jefferson Memorial? Show picture of monument. Where is the Jefferson Memorial located? Where did the artist, Alma Thomas, live for most of her life? The answer to both of these questions is Washington D.C. Discuss the differences between Abstract and Realism. Point out that this and Alma’s other painting do not resemble realistic objects. Alma has used COLOR, PATTERN, RHYTHM and LINE to create an EXPRESSIONISTIC design. These pictures are fun to look at and even more fun to paint. How does this picture make you feel? What kind of MOOD does it create? All answers are acceptable but try to solicit answers from the kids. You might suggest a single mood (playful, cheerful, fun, or happy) if the class has a hard time understanding what you are asking. Then ask the class to suggest other words to explain the feeling of the picture. Compare this picture with Les Fetishes. Both pictures were painted by the same artist. How are they different? One is realistic and one is ABSTRACT. 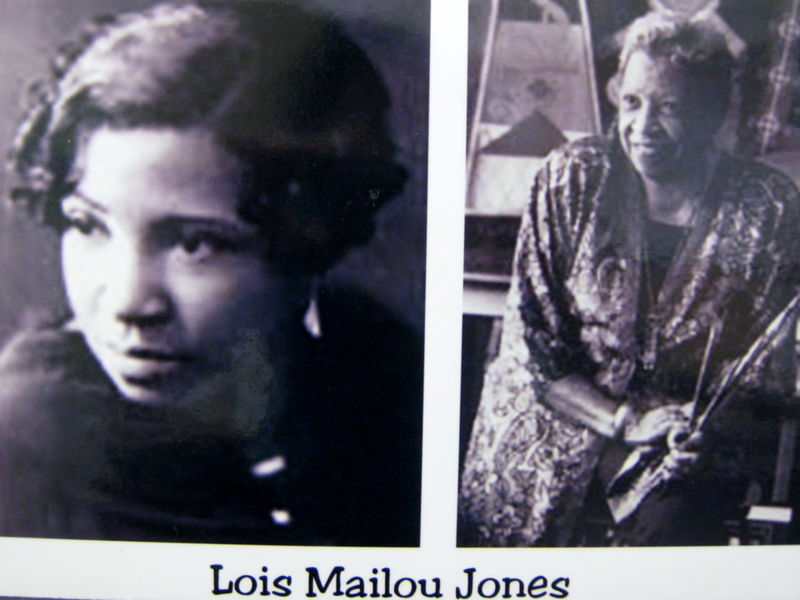 Lois Jones is known throughout the world as a great art teacher and a painter of amazing flexibility. This painting shows one of the injustices that many black Americans suffered during the 1940’s, especially in America’s deep south—persecution (very often violent) because of the color of their skin. The picture shows a man with his hands tied together. His face does not look angry, just quiet and helpless. The artist leaves us wondering what will happen next. We can’t see anyone else in the painting but we realize there must be someone else close by, because somebody has tied the man’s hands. The title of this painting gives a clue of who is standing just outside our view. What is a mob? A disorderly or riotous crowd of people. A crowd engaged in lawless violence. A group of people stimulating one another to excitement and losing ordinary, rational control over their activity. What is a victim? A person who is picked on or persecuted. What time of day is it, in this painting? We can see a black sky behind the man, around his head. Does the fact that it is night make the man seem to be in danger? Darkness usually seems more dangerous than daylight, especially in a picture where there is someone or something mysterious, just out of view. Laura Wheeler Waring was a painter, illustrator and teacher. She was born in 1887, in Hartford, Connecticut. Laura studied at the Pennsylvania Academy of the Fine Arts, in Philadelphia, from 1918-1924. She traveled to Paris to finish her art studies from 1924-1925. Laura painted with a realism that let the viewer know that she had high respect and affection for the people in her portrait paintings. Her flair for depicting colorful personalities, and the warmth in her portraits, makes her work stand out from that of other black portraitists of her day. (A portraitist specializes in portrait painting.) It is easy to like the people in Laura’s portraits. Laura died in West Chester, Pennsylvania, in 1948. 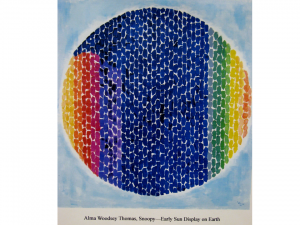 The “Alma” in this portrait is the African-American artist Alma Thomas. Alma Thomas painted Snoopy—Early Sun Display on Earth and Flowers at Jefferson Memorial, which are also in this Art Discovery Packet. The artist who painted this portrait, Laura Wheeler Waring, knew and respected Alma Thomas very much. Alma was Laura’s friend. Both Alma and Laura were born in America less than 30 years after the Civil War. The grandparents, and probably the parents, of both of these women probably knew and experienced slavery themselves. The movies and books about Civil War times depict most African-American slaves as extremely poor people with hardly, if any, education. 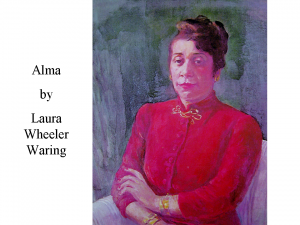 Just a generation or two later, this portrait of Alma creates a very different picture of an African-American. Alma (the woman in this portrait) is dignified, elegant, and well-dressed. She has a friendly confident expression. Alma went to college and had a Bachelor’s Degree and a Master’s Degree. Most women of her time, black or white, never even went to college. For any woman born in America before the 1900’s, going to college and graduating was a huge accomplishment, especially for an African-American woman! This painting was painted about halfway through Alma’s life, when she was in her forties. Although it was painted in 1945, Alma looks very much like a woman of today. Although Alma was born in 1891 (in Columbus, Georgia), she seemed forward thinking enough in her actions and her manner (which Laura Waring illustrated well in this portrait) that she probably would easily fit in with the ideas of American women today. Does the woman in this painting look like she does things her own way? Alma definitely did things her own way, all of her life. Display her paintings next to her portrait. These paintings that Alma painted are a good example of how Alma did things her own way. Alma created her own style of modern painting in her later life, which is when she painted Snoopy-Early Sun Display on Earth and Flowers at Jefferson Memorial. Do you think this woman would make a nice Teacher? Alma was a teacher, who taught in the Washington D.C. Public School District, for more than 40 years. She also did a lot of volunteer work with children’s clubs and organizations. Have the class paint or color a portrait of their teacher. Tell the teacher in advance that she will be posing for the class. Since Alma was an art teacher, have the kids paint or color a portrait of you—the person who teaches them about art. Pose for them in a sitting position, similar to the one that Alma is in. Have someone in the class pose, at the front of the class, in a sitting position similar to Alma’s. The class can paint or color a portrait of this classmate. Create a portrait using cut paper as the medium. Growing up in a basement apartment, nestled in Southside Chicago, Annie Moten, with her seamstress mother and older brother, learned life skills that have carried her to becoming Annie Lee—successful artist, seamstress, entrepreneur and gourmet cook. Although her mother held on to Annie’s early drawings and encouraged her skills, “mama” didn’t necessarily envision painting as a valid career path for her creative daughter. Annie, at 17, turned down a full four-year scholarship to Northwestern University for the security of secretarial school, a “good government job”, and the more traditional roll of wife and mother. After the birth of her daughter, Annie’s first husband died of cancer, while in his early twenties. The young widow later remarried and had a second child, a son. A few years later, Annie became a young divorcee. Although she always yearned to express her artistic ability, two kids, work and life’s hectic demands left Annie little time to paint. 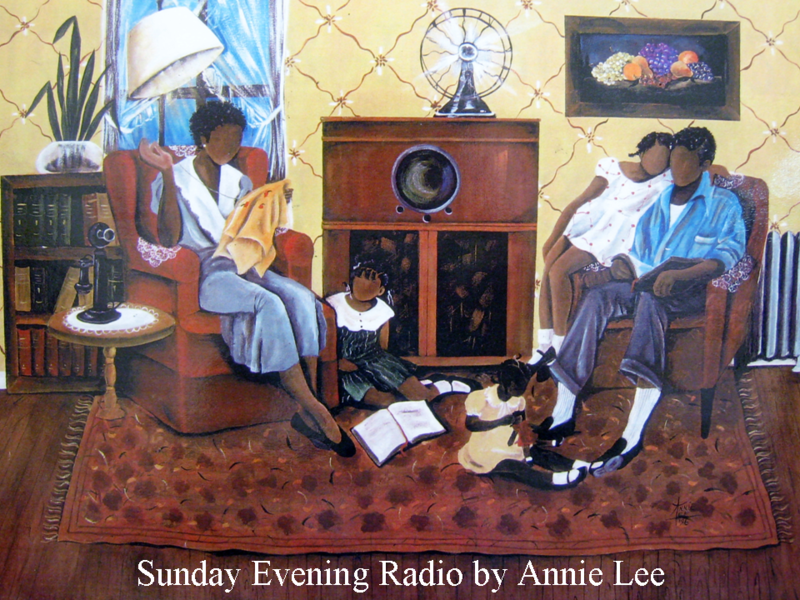 Today, many of the subjects for Annie’s paintings of African-American family life come from memories of her childhood and from the challenges Annie faced as a single mother, working to support two children. Possessed with a solid working-class spirit, determination, and energy, Annie started college. Attending school at night, eight years later Annie finished her undergraduate studies at Mundelein and earned a Masters in Education from Loyola. American families, in the 1930’s—early ‘50’s, did not have televisions. Yet, almost every family had a radio, usually a large one in a wooden cabinet, in their living room. This painting is like a memory from Annie’s childhood days. This African-American family is sitting in a typical 1930’s-1950’s style living room. Hardwood floors with throw rugs, radiators (behind the chair on the right), overstuffed chairs, standing floor lamps, wallpaper, and the large family radio are typical furnishings and looks from this time period. Today, a television would probably replace the radio. Watching TV on Sunday evening is a tradition for many families across America today, just like listening to the old radio shows (The Shadow, Amos and Andy, the Green Hornet) was, in the 1930’s through the1950’s. What strange thing do you notice about this family? All of their faces are blank. Why would an artist paint a picture this way? All the people that Annie Lee paints have blank faces. She feels that this family portrait represents any African-American family of this time period. 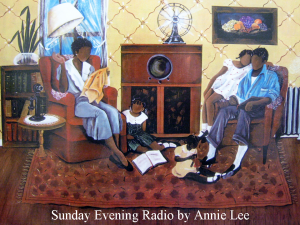 She wasn’t painting any particular family, but a representation of ALL black families, so Annie felt she didn’t need to add the faces. She painted what was a typical American family from that time. Paint or draw your own family doing what they typically do on a Sunday Evening. Bring in audio tapes of the old radio shows (like the ones mentioned above) and let kids listen to them as they create their pictures. Create cut paper pictures of a family, using cut colored paper. Make patterned clothing using wallpaper or wrapping paper. Leave the faces blank, the way this artist has done.